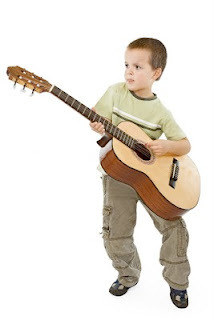 Guitar Blog: Why do children really want to stop lessons? This is perhaps the most important question parents will need to ask at some point because understanding the answer may prevent your child giving up guitar unnecessarily. In fact I would go as far as to say over 90% of children give up on guitar due to a misunderstanding. When I take teachers through our teacher training program I point out that parents know their children better than anyone. A parent is often much more likely to recognize when their child is not happy, frustrated or losing confidence. Parents are almost always the first person to know when things are not going well and this explains why teachers can often be surprised when a parent calls up to say that they will be stopping lessons. I then go on to explain to teachers that while parents know their child they do not necessarily know how to respond to their child when the learning experience is not going well. Naturally when parents see their child unhappy they respond by ending the apparent source of their misery. Guitar practice. This outcome can fortunately be avoided. When children decide to stop lessons they usually move through a three stage process. Stage 1. Frustration. The work set by the teacher is too challenging or misunderstood resulting in frustration. Stage 2. Loss of confidence. The child begins to lose confidence due to the ongoing difficulty or lack of understanding. Stage 3. Practice stops. At this point they just stop trying deciding its not worth it. Frustration is your first sign of trouble ahead. Parents who are aware of this early sign should speak to the teacher and if possible sit with their child when they practice. A good strategy is to ask your child to teach you. When they teach you they think differently. Suddenly they are the expert so aim to see the problem from a different perspective. Parents who address frustration from the outset will rarely see their child move to stage 2. The most obvious signs of a loss in confidence come in the form of self defeating statements like "I can't do it" or "It's too hard". A loss in confidence is really just honesty. They see that the task is above and beyond their current ability or understanding. All too often well meaning adults will simply respond with "Come on. You can do it!" While these words are encouraging they don't make for practical advice. When a task is too difficult the trick is break it down. I use the 'step' analogy. Imagine a 2 year old climbing adult stairs. If the steps are too high they give up. Put smaller steps and they can do it. This is where an experienced teacher makes all the difference but parents can play a big role by monitoring their child's practice and speaking to the teacher. By this point it can be difficult but not impossible to get them back on track. The best solution is to discuss the current practice with their teacher and try to start fresh. If the teacher is unable to help and the situation does not change it may be time to find a new teacher. Different teachers have different strengths and weaknesses so if your child is not responding it does not mean the teacher is not a good teacher but rescuing students at this stage may just not be one of their strengths. The best approach is to work closely with your child and teacher from day one. Parents who work closely with their children will usually get a better result and the issue of wanting to stop guitar lessons is unlikely to ever arise. When a child wants to stop lessons the first two stages have probably been overlooked. The only real exception to this is when a child is forced into learning in the first place but that's another topic. In my experience very few students really want to quit guitar. They just want to escape the frustration and regain their confidence and too often giving up appears to be their only viable option.